You may remember that I’ve written about Apple Pie before, an organic bilingual tea salon/restaurant owned by Rennes’ resident Irish lass Lisa. Apple Pie came to my rescue once again today by giving me my American fix of Thanksgiving’s greatest gift: pie! Despite living in a country where people are generally unaware that Thanksgiving exists, I was able to get into the holiday spirit today because of the traditional Thanksgiving treats that Lisa whips up each year around this time. This morning saw me sitting at a cozy table with my best friend and fellow American Emma, sharing Thanksgiving cheer and two pieces of absurdly delicious pie. 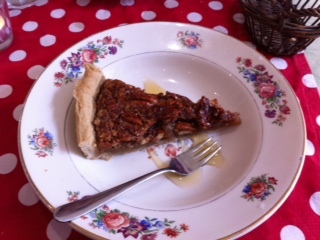 I have to say, Lisa’s pecan pie put to shame any American counterpart I’ve ever tried. But, one thing is for sure – there will be no reasonable eating habits this weekend. 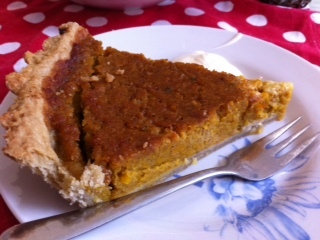 It’s Thanksgiving in France Part II. Maybe you remember Part 1? This Saturday a group of Americans and I (and some honorary international guests as well) will do the whole Thanksgiving spread, and we’re doin’ it right! Check in next week to read all about our food babies and what caused them. Until then…Happy Thanksgiving!!! Et bon appétit!